The former chief inspector of immigration in Britain, John Vine, has said that the UK Border Force cannot cope with the influx of migrants to the country as its most experienced officers reach retirement age and are not being replaced. The Border Force is losing some of its most experienced officers, who have the knowledge and expertise to spot lorries being used by criminal gangs and stowaway migrants, according to Vine, the Telegraph reports. 40,000 suspected illegal migrants were stopped at UK ports between April 2014 and 2015 although many more would have made it through undetected. Vine said it was not sufficient to rely on spot checks on the thousands of vehicles passing through Britain’s ports every week. “The sheer volume of traffic coming through these ports is such that only a small portion of traffic can be checked without the ports being clogged up. It has to rely on good intelligence. When I examined this in 2013 I found a lot of the older, experienced staff were leaving and they weren’t being replaced. Experienced staff on the front line will watch and see suspicious behavior and that’s as valuable as the proper use of intelligence,” he told the Telegraph. Vine’s comments come a day after 68 people were found crammed into lorries at Harwich in Essex.Hidden among washing machines and freezers the group included 35 Afghan nationals, 22 Chinese nationals, 10 Vietnamese and one Russian. Two pregnant women were among them and have been taken to hospital; four Polish truck drivers have been arrested. In August 2014, 53 migrants were found in a container at Tilbury Docks in Essex; one of them, a 40-year old from Afghanistan, was dead. And in February two illegal migrants died after leaping from a ferry also at Harwich and attempting to swim ashore. Both were sucked under water, one drowned and the other was chopped up by the ship’s propeller. Even those who are found by border guards face a long wait for their asylum claims to be processed, and if unsuccessful will eventually be deported. 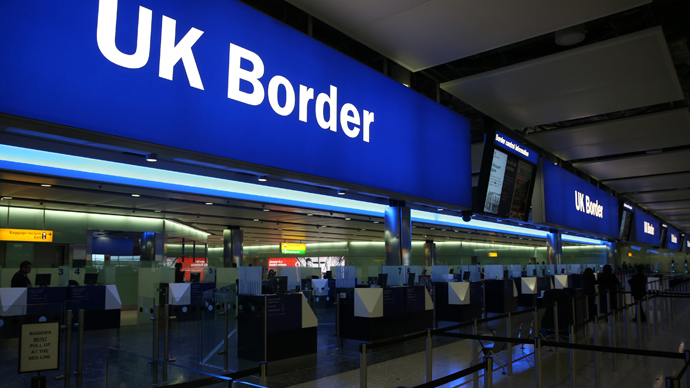 The figures released last month show how “how difficult it would be to reduce net migration to the tens of thousands,” said Madeline Sumption, from the Migration Observatory at Oxford University. “Net migration has risen even despite new restrictions on family, work and student visas that were introduced during the last parliament,” she added. Also in May, Britain offered military and intelligence support in the fight against people smugglers in Libya and the Mediterranean. The Mediterranean migrant crisis has claimed the lives of around 1,800 people in recent months, with many more being rescued by an international flotilla. However the UK has refused to sign up to an EU plan to resettle migrants who have been rescued while trying to cross the Mediterranean.